Forgive my singing in the verses, I got a little carried away! That sounds like a hell of a good time. It was. Unfortunately they didnt come on until around 3PM and the event had been going all day so a fair amount of people left and they missed out - even the MC said the people that left missed the best performance of the day. They're playing in April a bit up the road from here so I think I'll go check them out again. 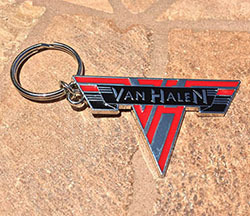 They also do material by the Who, hence the name "Van Wholen." They only played one Who tune - Squeeze Box - and it was damn good. I wish I would have recorded it, it sounded like Van Halen covering The Who. They're good! Glad the storm broke in time for the show. Here's Unchained. Check out my son rockin' out at the 1:23 mark!